Sharing heartfelt anniversary words with your beloved, will never go out of style. 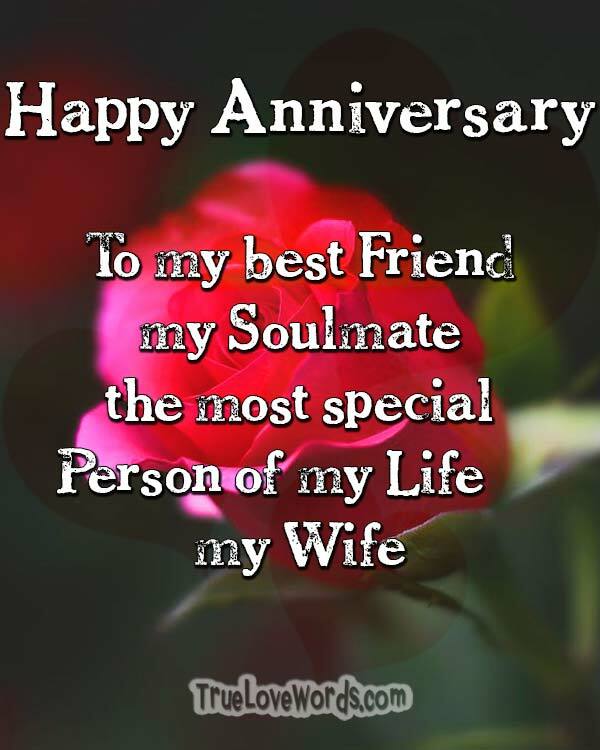 While each day is another chance to say I love you to your wife, an anniversary commemorates your special day. 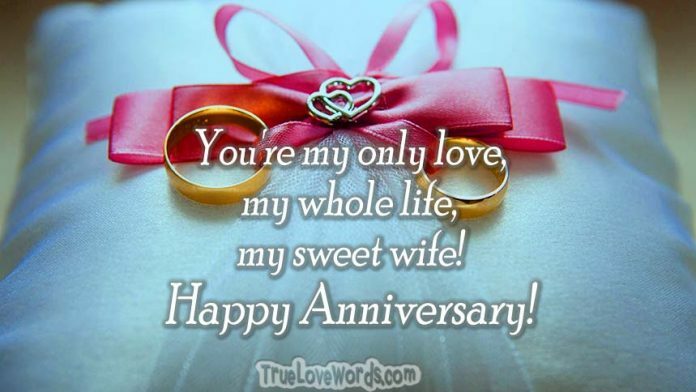 An anniversary is a special time of year between a husband and a wife. As a husband you should never forget this special day. 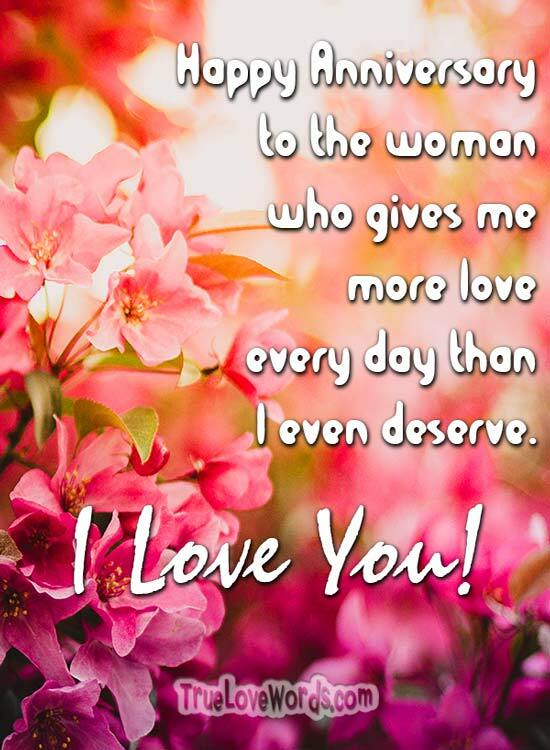 As it’s a bit difficult sometimes for men to write a nice and sweet wish for this celebration, we composed a beautiful bunch of romantic wedding anniversary wishes for wife to share with her and make your marriage anniversary extremely special. ♥ To the woman I married with love in my heart. I’m never alone, even when we’re apart. May our marriage last forever! ♥ To my wife of many years, it never gets old to say I love you. ♥ The smile you give me, still melts my heart. Happy Anniversary my dear. ♥ Through good times and bad, through sickness and health, you’re my number one, my love, and my wealth. ♥ Today is the day two hearts turned to one, thank you for all the love you have brought to my life. ♥ On our anniversary and each day I live, I promise to cherish the love that you give. ♥ Happy Anniversary to the woman who gives me more love every day than I even deserve. Let’s make our marriage more awesome! ♥ Today is a day to celebrate the love I have in my heart for you. I love you always honey, and can’t wait to see what the next year brings. ♥ I love you isn’t enough for a woman like you. You’re my only love, my whole life, my sweet wife and I cherish every day I get to spend with you. ♥ God knew what he was doing when he brought you into my life. I’ll always be grateful that you you are my wife. ♥ Today and all days, I will love you forever. You bring so much joy to life, even when life gets hard. You always know how to make the most of everything. ♥ How is it that I can still get goosebumps when I see your beautiful face? Happy Anniversary to my beautiful wife, no years can erase the special feeling I have when you walk into a room. ♥ Each time I look at you, I am reminded why I wanted you to be my wife. I love you sweetheart, Happy Anniversary my sweetheart. ♥ I never knew life could be so perfect until I met you. Thank you for always being there for me and showing me how love can conquer all things. Here’s to us on our anniversary. ♥ On our anniversary, I promise to love you always. You are the woman I love and I cherish each day we spend together. May our marriage last forever! ♥ Happy Anniversary to the woman who said I do on this special day. I love you more than you’ll ever know. ♥ An anniversary is a time to share the special love that exists between you and I. Thank you for being you and being by my side. ♥ I love you now and will love you forever. It doesn’t get any more simple than that. Happy Anniversary to my beautiful wife. ♥ I love you never seems like enough when it comes to how I feel for you. Your smile lights up a room and I am forever grateful to call you my wife. ♥ I believe God had a plan when the two of us met. To love, to cherish, and to hold forever. ♥ On our anniversary, know that you are the best thing to ever happen to me. I love you, sweetheart. Thank you for all you’ve done for me! ♥ There isn’t enough love in the world to explain how full my heart gets when I think of you. Together forever, your loving husband. ♥ When times get tough, I remember how I feel about my beloved wife. You are my rock, my foundation, and together we can get through anything. ♥ Happy anniversary to the woman of my dreams. From the moment we met, I knew I wanted you to be my wife. Happy anniversary! ♥ Marrying you was the best thing ever to happen in my life. Happy anniversary. Here’s to many more years as husband and wife. ♥ You are the reason our family is still stacked together, the reason of our marriage will last forever end ever! Happy anniversary to the most special person of my life! ♥ When I think of you, I know I married my best friend, my confidant, my soulmate. Happy anniversary on our special day. ♥ It’s not enough to say I love you, but sometimes other words fail me. I love you honey, and wish you a happy anniversary from the bottom of my heart. ♥ Today and always, I celebrate the day we both said I do and became one in the eyes of God. ♥ For our anniversary, you need to hear that I love you, I honor you and I will always be here for you. ♥ On our anniversary, I am grateful for the love that you give every single day. You are loved, and I will never take you for granted. Happy anniversary! ♥ Love always wins. No matter what is going on in our lives, I know that together we can accomplish anything. Happy anniversary to the woman who always has my back. ♥ Beautiful, cherished, loved are only words, but they are all I have to share how I feel for you on our anniversary. ♥ My heart is open and in your hands. Forever and always on our anniversary and each day, your loving husband. ♥ I am the luckiest of husbands, because I get to call you my wife, each and every day of my life. 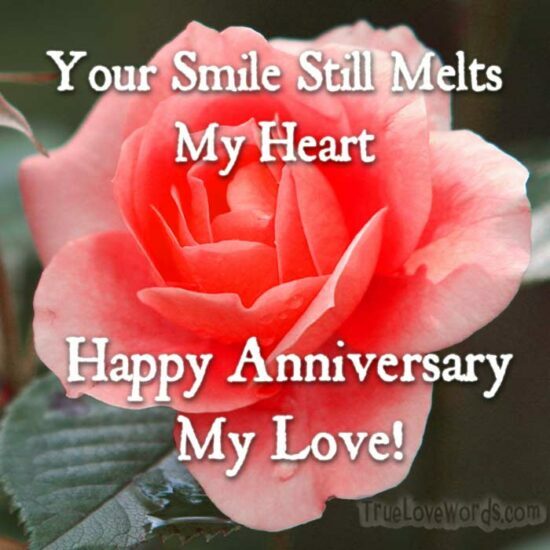 ♥ Our anniversary may mark our special day, but you deserve to feel my love every single moment of your life. May God bless our marriage eternally! ♥ For the woman I married on our anniversary, never forget that you have reached the deepest parts of my soul. I love you forever and always. ♥ Take my hand and never let it go. I promise to love you as I did on our wedding day and every day forward. Even when life gets hard, I cherish you every moment. ♥ Loving you is the easiest thing I have ever done with my life. Happy anniversary to the woman who said yes and never looked back. ♥ Today is the day we became one in front of our family, our friends, and God. I celebrate the love we share everyday. Happy anniversary my love! ♥ Forever isn’t long enough when I think about how much time I want to spend with you as your husband. Does Your Partner Taking You For Granted?